CRAMCO CARTER 5PC SET WITH FORMICA TABLE TOP. 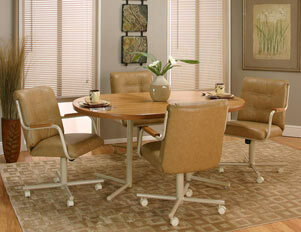 The Carter chair is a buff polyurethane vinyl with mocha swivel tilt caster chair base. A variety of table shapes and sizes are available to choose from. This set also comes in an expresso metal finish.